Haircuts for men and hairstyles may seem like a vain thing to write about but the truth is that a lot of guys are interested in this topic! This is particularly true if you are a guy who hits the gym regularly and interested in achieving a hairstyle look that accentuates your general appearance. And let’s be real now for a second – what guy doesn’t want to look his best? I’ve written about male celebrities in the past, including various men’s grooming routines. Culturally speaking, we look to celebs for pointers on the latest fashion trends. We also check them out to see how they achieve a certain look. This is particularly true when it comes to the topic of men’s haircuts! I’m going to walk you through 7 male celebrities who have great versions of men’s haircuts that you can consider for your own use. When possible, I’ve also tossed in the likely hairstyle products these men use to make their hair look amazing. Channing Tatum has sported a very cool men’s hairstyle in the past known as the high and tight. It’s masculine, easy to take care of and fairly simple to pull off. Wear a little scruff and you will look really cool. Make sure your barber knows how to do a fade, starting with a low number and then increasing in length on the way up. Chris Hemsworth was named sexiest man alive by People Magazine. The thing about Chris is that he always has a down to earth look – including his basic crop cut. He keeps it short on the side and on the top most of the time, unless he is playing the role of Thor! Most barbers will know this particular men’s haircut style. Just mention “crop cut” and your stylist will get the basic idea. Hairstyle Product: Use something that gives you texture, like American Crew Forming Cream (See Amazon). I’ve written about Zac Efron and his skincare routine in the past. It makes sense now to write about his slicked back hair style. In many ways, Efron sports a classic look that requires some work but looks great you have it right. In many ways, this is what guys used to wear in “old” Hollywood. If you have wavy or curly hair, this one might work very well. The trick is to keep the sides a medium length and the top longer. Hairstyle Product: Use something that provides shine and sheen, like Admiral Pomade. (Check Amazon for price). Chris sometimes styles his hair in different ways with ideas that men like you and I can benefit from. The one you see here is called the Surfer Cut. Some people have referred to this as the “bed head” cut but since Chris likes the ocean, this name seems more fitting. To achieve this wet look, ask your barber for the crop cut. To shape, just run some gel through your hair and texture it a bit. No need to do a bunch of work. Think wind, beach and surf! Hairstyle Product: Axe Wet Shine. (See Amazon). Shemar Moore is the crime fighting FBI agent from CBS’s Criminal Minds. He’s also a dude who takes serious care of his body. His hairstyle perfectly complements his Ectomorph physique. He sports a short men’s haircut and likely has his barber use a ½ guard. The great thing about this particular style is that you don’t need to do much to take care of it – except make sure it gets cut on a regular basis. Hairstyle Product: Maybe some pomade but not much is really needed. If you have visited this blog in the past, you will recall the post I created on all things Chris Pine. This particular star has a men’s haircut that I like to call the professional comb over. I call it this because the hair is combed over but also has a professional, businessman’s quality about it. This look was particularly present in his appearances as Captain Kirk in the Star Trek reboots. To achieve this look, go short on the sides and leave 2-3 inches on the top. Make sure your barber uses a fade on the way up. Hairstyle Product: Use a forming cream and finish with Redken Outshine Polishing Milk (See Amazon). 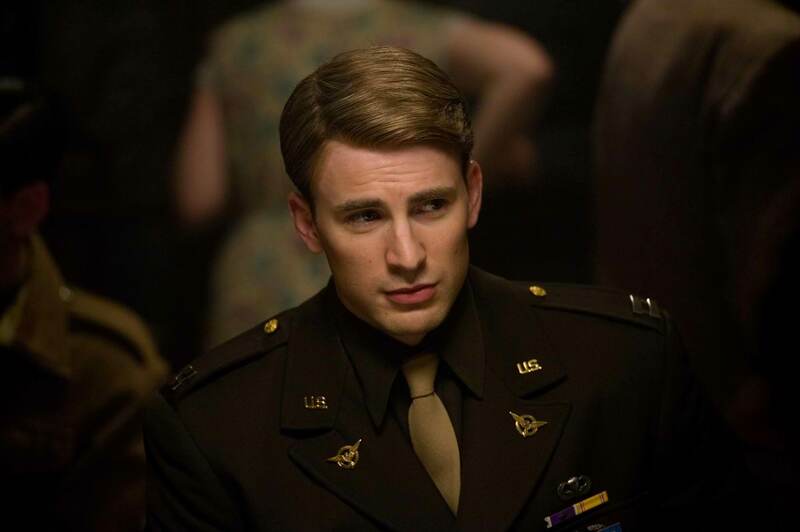 Chris Evans has sports lots of different hairstyles over the years. The one I will focus on, however, is connected to his role as Captain America. Here, you see the actor with a traditional, American “classic” look that is parted to the side. To achieve this look, keep the hair semi-short on the sides and longer at the top (about 4 inches with blended bangs). You may want a semi-fade on the way up. Evans had his hair highlighted, which looks good with this kind of men’s haircut. Hairstyle Product: Finishing cream and hairspray for volume, like Pantene Touchable Volume (See Amazon for price). What is important to keep in mind with haircuts for men featured here is simply this – most celebrities have an armada of personal assistants and stylists that help them look a certain way. It’s all about image management in Hollywood. If you think just the female stars have helpers you might want to think again. I mention this because getting a men’s haircut that fits your lifestyle is more important than achieving a certain look. For example, if you are an active dude that doesn’t have a lot of time to fuss around with your hair, it might be best to opt for something simple, like the basic crop cut or the high and tight. If you feel you have the time to style your hair more elaborately – right on! Just make sure your grooming efforts don’t cut into your gym time.